I attended a local university for my second two years of college and lived at home. While a lot of college students would hate living with their parents and teenage brothers, I tend to look back on those days very fondly. During that time my youngest brother (who was 10-11) had a music lesson every Thursday night across town and my parents, my other brother, and I would ride along (in a minivan, natch), go shopping during his lesson, and then eat at a local Italian place, Joe’s. The food there was a no-nonsense baked pastas and pizza, but the real standout was their signature salad – The Joe’s Salad. It was one of those salads so rich in cheese and meat that it could hardly be classified as actual salad, but so delicious that you couldn’t stop eating it. So, when I found this recipe it went on my menu immediately – and will be repeated often in the coming months. A dinner salad is one of my favorites in the summer because it requires no cooking – you don’t get a hot kitchen from oven/stove use, and since the meal itself isn’t warm it has a cool, refreshing taste. I feel like I’ve run about 10 degrees too hot since 2011 since I became pregnant for the first time so anything to avoid heat in the summer is excellent. 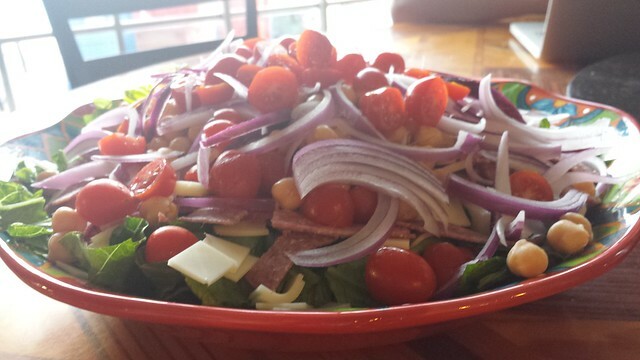 Give this salad a try – like all salads, customize it to fit your needs and preferences. As always, I prefer to serve the dressing on the side so the leftovers don’t become soggy. Also, I bought a half pound of both the salami and provolone, expecting to use it all, but it was too much. You could get by with 1/4lb, but I thought 1/3 pound was about perfect. 1. Chop the lettuce, finely slice the onion, and dice the provolone and salami into bite-sized pieces (I had them sliced thick in the deli, then cut them into small ribbons. Cut the tomatoes in half and arrange all of the chopped salad ingredients into a large bowl. Top with the drained and rinsed chickpeas and pepperoncinis. 2. To make the dressing, smash the garlic cloves, oregano, and salt together with either a knife or a mortar and pestle. Combine with the other dressing ingredients and serve. I typically put my dressing in a jam jar so I can shake it to combine, but whisking works fine, too.